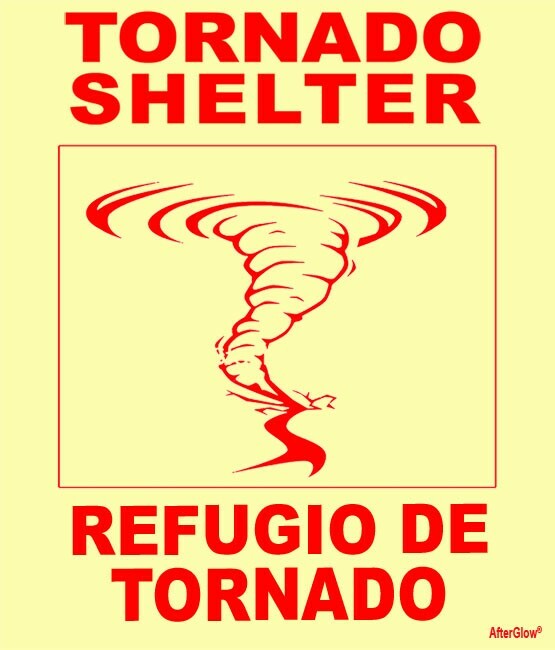 This Bilingual Tornado Shelter Sign (English & Spanish) contains the text "Tornado Shelter" and "Refugio de Tornado", as well as a tornado image, and is comprised of a photoluminescent layer, bonded with a semi-rigid substrate, incorporating a foam polyester tape adhesive. The long-lasting adhesive is suitable for either smooth or rougher surfaces like CMU (Concrete Masonry Unit) blocks. This substrate material minimizes surface imperfections on the sign, and the high performance photoluminescent surface makes the sign easier to read in low light conditions, such as those that may be present during power outages, storms, or other severe weather. Sign dimensions are 11" x 14".